New Delhi: Biocon Limited, India’s largest biopharmaceuticals company that is gradually transforming itself into an innovation-led biosimilar developer, expects to expand its presence in the United States (US) this year. The focus of the company has been to be a pioneer in the field of biosimilars, which are considered cheaper copies of biologic drugs that promise a new way to cut healthcare costs. “Today, Biocon is India’s largest, fully-integrated, innovation-led biopharmaceutical company. Our commercial footprint covers 120 countries. We invest up to 15 percent of our biopharmaceuticals business revenue in R&D. In terms of market share, our capacity to manufacture high-quality, affordable biologics puts us among the top three global biosimilar players for insulin.” Dr Shaw said. “Underling the importance of women’s participation in an economy the women must be encouraged to don the entrepreneurial hat if one wants to accelerate the economic growth of a country. Women have a very important role to play in India’s growing economy. Entrepreneurs, of course, have a very sizeable role to play in India’s new economy and in that, women must have an equitable share and it is only then we can say that India as economy will truly be world class,” the Biocon chief added. She pointed out that entrepreneurship is an important economic activity for a country like India as it leads to job creation. For every job that you seek, an entrepreneur creates 10 and that is the multiplier effect of a startup. Today we talk about being challenged in terms of job creation but entrepreneurship and micro entrepreneurship is really the way forward. And it is really not about tech jobs but it is also about creating enterprises out of simple ideas,” she added. 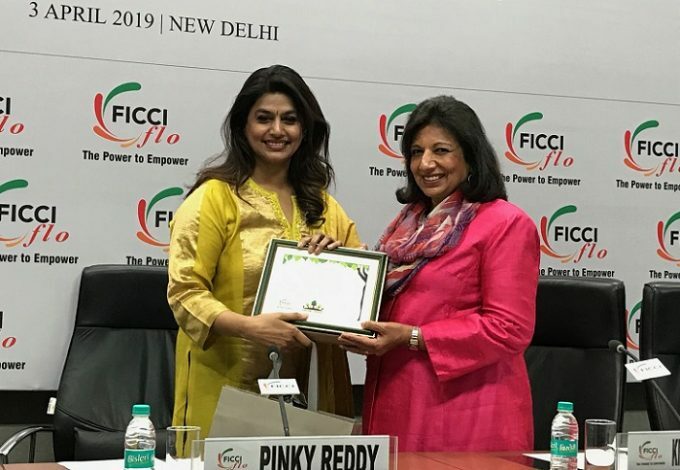 “The session with Dr Kiran Mazumdar Shaw is a part of FLO activities and its mission of giving the society and the females the “The Power to Empower”. It brings together women achievers from all sectors and not just celebrates their success stories but also creates a trail for other women so that they could embark on their own journey towards success. “ Ms Pinky Reddy said. “Dr Shaw has been the face of female entrepreneurs as has been highlighted by the many awards that she has received. She has been listed in many influential rain lists like TIME magazine’s 100 most influential people, Forbes’ List of ‘World’s Self-Made Women Billionaires’” she said. ‘The session was aptly titled “Entrepreneurial Journey of Kiran Mazumdar Shaw: An Empowering Story”. It indeed showed how entrepreneurship is a “journey”, a work in progress and how one has to go through challenges everyday in order to succeed. Ms. Mazumdar-Shaw prefers using “compassionate capitalist” over the word “philanthropy”. Her story is a true example of how a “compassionate capitalist” can go on to make changes in the society, improve lives of the people through innovation and commerce,” said Ms Reddy. Dr Ranbir Singh , Chief Election Officer, Delhi along with Dr Subbarami Reddy, Member of Parliament and Dilip Chenoy, General Secretary, FICCI were present on the occasion.